In the summer of 2014, volunteers will construct a work shop for campers in honor of Paul Johnson, who went on to be with the Lord unexpectedly in October of 2011. Paul, affectionately known to many people as 'Uncle Putty,' was renowned throughout the state as a strong Christian leader, mentor, hunter, musher, crabber, outdoorsman, caregiver and friend. You can read more about his remarkable life and legacy here. The Paul Johnson Memorial Shop will be a place where campers do hands-on projects building ulus, woodworking, mechanic work, and fixing things. Paul mentored many young people in the region. In teaching them a great deal about subsistence, giving, and life he was always patient and modeled the humble and generous love of Christ. The PJM Shop will be a space where Paul's legacy of mentorship continues. Paul's life impacted so many people that a ripple effect will continue for several generations. 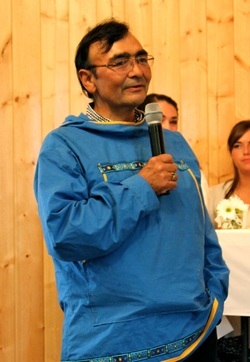 In an incredible acknowledgement of Paul's legacy, ProWest has committed to cover the considerable freight costs to get the building materials to Unalakleet. The City of Unalakleet has elected to designate NSEDC funding earmarked to support the youth of the community to help with the cost, and countless donors from Unalakleet, Norton Sound, Alaska, and beyond contributed significant items and funds during the Auction on March 8, 2013. Quyanna to all who contributed. If you are interested, please contact the Camp Director. The shop is also in need of several new or gently used tools for campers. If you would like to send us power tools or woodworking tools in excellent or new condition, please contact the Camp Director. Download a Brochure to share.